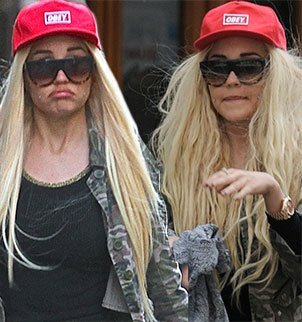 Amanda Bynes has changed her outrageous hair extensions which covered up her shaved head after she said her hair was damaged. Amanda Bynes, 27, stepped out on Tuesday morning for another trip to a New York salon where a miraculous transformation occurred getting new matted hair extensions. Earlier a number of dreaded ropes hung messily down the actress’s shoulders. The blonde tangle was kept in place by a red Obey trucker hat but strangely she didn’t ditch the cap after she had her follicles fettled into good shape. Amanda Bynes wore a camouflage army jacket, black tights, and leather high heeled boots. The former teen idol sported a thick gold watch and toted a Louis Vuitton gold handbag as she stretched her hands out in front of her while making her way along the street.